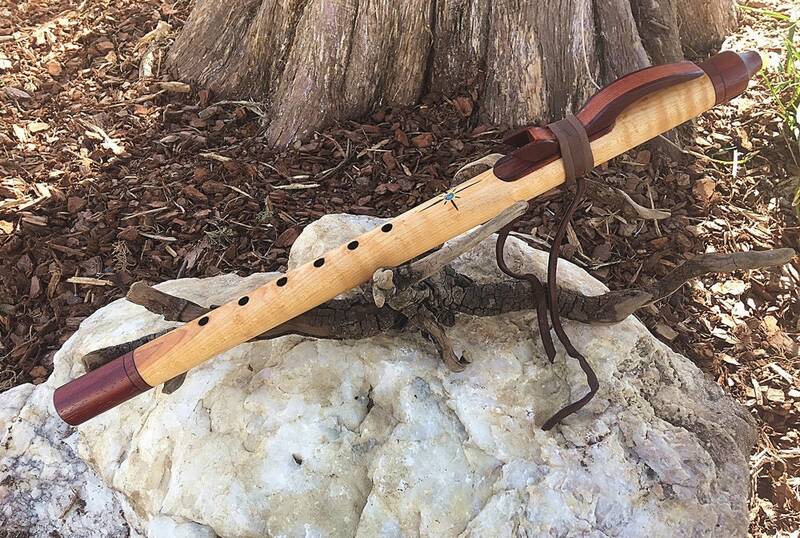 Native American Style Flute, Curly Maple key of G from Tree of Life Designs. Native style, six hole flute in the key of G minor. Hand crafted from nicely figured curly maple with fully tenoned end caps of padauk highlighted with inlaid mahogany bands. 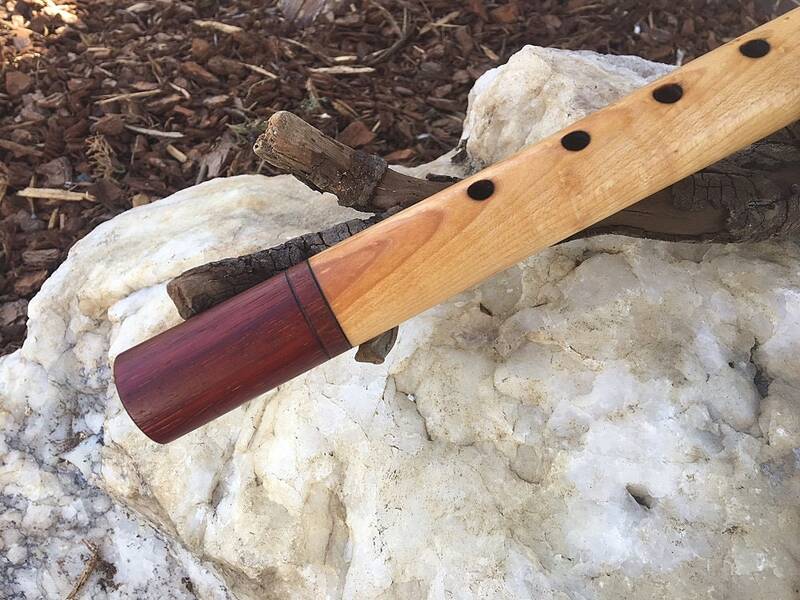 This striking looking flute is bored from a solid blank of curly maple. Topped with multiple, hand rubbed coats of 100% natural oil and wax finish for a gentle, warm glow. The flute also features my signature hand burned "morning star" with inlaid abalone cabochon center below the sound hole. The stylized bird fetish is crafted from padauk with a mahogany core . The bird is secured with a lace of chocolate brown deer hide leather and sits atop an inlaid padauk nest. This is an attractive flute with an expressive, vibrant voice. It plays and projects well with great stage presence and excellent backpressure. The overall length is 21-1/4 with a 7/8" bore. 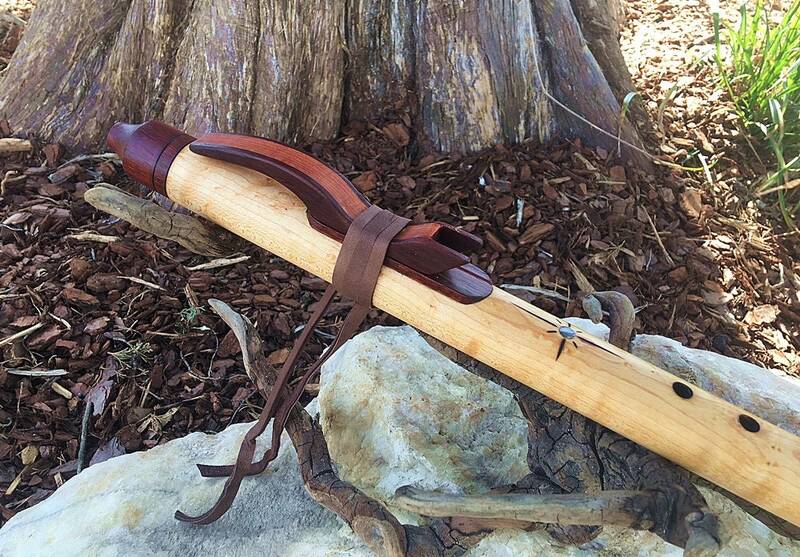 The flute comes provided with a hand sewn fleece draw string bag for storage and protection. Shipping includes Priority Mail, insurance and signature required USPS fees. 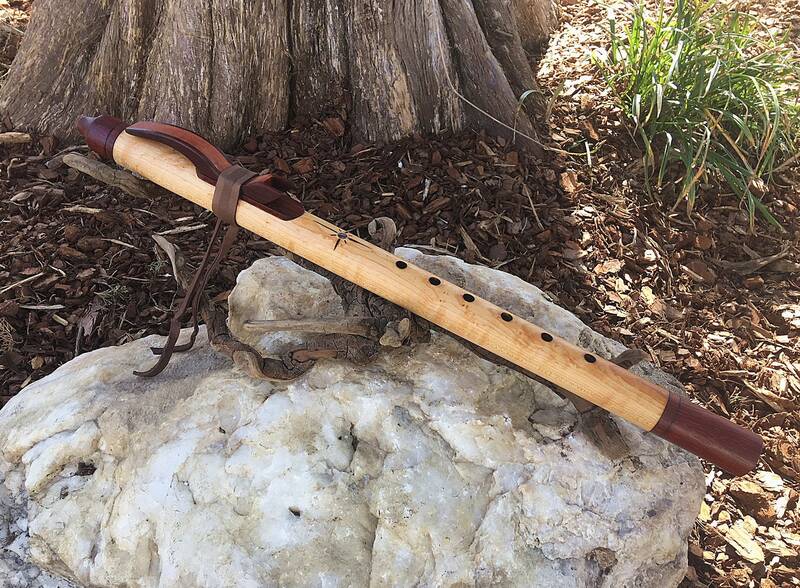 *All Tree of Life Flutes are electronically tuned for accuracy and finished with environmentally safe natural oil and wax finishes for your safety as well as mine. Each flute is individually voiced for strength and quality of the sound as well as playability. They feature a modest back pressure, play well softly but especially love to be pushed. Each flute I make comes with my concern for your satisfaction in mind. Each is line bored from a premium solid wood blank, not split, and finished with natural oils for my protection as well as yours. My workmanship and your satisfaction are guaranteed. **Disclaimer: Some of the flutes that I make are Native American in Style only. My products are not Native made, I am not and make no claims to any Native heritage or Tribal affiliation.